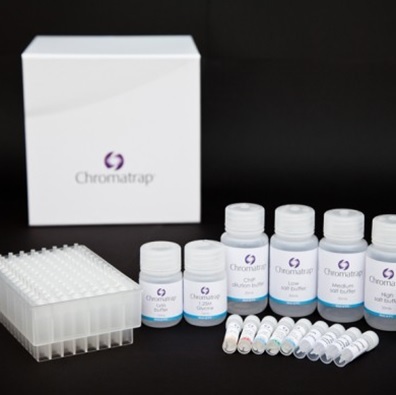 Chromatrap, a business unit of Porvair Sciences, has announced a major product launch at the European Human Genetics Conference (Glasgow, UK) and the Festival of Genomics (Boston, USA) on the 6th June 2015 and 22nd-24th June 2015 respectively. Visitors to the events will be able to see a new high-throughput ChIP Sequencing product and learn about Chromatrap's latest developments in solid state Chromatin Immunoprecipitation (ChIP) technology. The new ChIP-seq kit utilises the company's proprietary solid state technology in parallel with high-throughput sequencing to deliver a streamlined ChIP-seq protocol from small cell numbers and low chromatin concentrations. Specifically adapted for broader chromatin concentrations, ChIP-seq combines the dynamic range of Chromatrap with the downstream analysis power of deep sequencing. This allows faster, more reproducible genome wide identification of TF binding sites and specific DNA associated protein modifications. With no limitation in scale or resolution, NGS can elucidate the role of TFs and epigenetic marks on gene transcription and epigenetic chromatin status. The Chromatrap ChIP-seq kit allows users to perform up to 24 ChIP assays from cell collection through to immunoprecipitation, including up to 10 chromatin sample preparations. The kit provides all of the major components required for performing ChIP assays to obtain adequate high-quality DNA for NGS library preparation. With the kit users can sequence from as little as 10-50 µg of chromatin and perform up to 10 library preparations form a single IP. With selective and sensitive enrichment of low chromatin loading and optimised elution buffer chemistry allows for high quality and quantity of immunoprecipitated DNA. The kit is also available in enzymatic format for shearing of DNA by enzymatic digestion and a 96 well microplate format for high throughput ChIP SEQ. Chromatrap solid-state ChIP assays are quicker, more sensitive and require less input chromatin than other methods, due to the powerful inert filter that selectively binds the DNA of interest, whilst rejecting all other nuclear debris, unbound antibody and buffer components. The result is a quick, easy and sensitive protocol for producing high-purity DNA fragments which may be used for RT-PCR or sequencing. The European Human Genetics Conference (www.eshg.org) is a forum for all workers in human and medical genetics to review advances and develop research collaborations. Covering the latest advances in translational and clinical genomics, the Festival of Genomics (www.festivalofgenomics.com) is an event to meet, showcase research and progress, share ideas, explore, inspire, do business, and ultimately, to deliver progress for patients.